Race car driving family Mario, Michael and Marco Andretti; Easter decorations with Martha Stewart. The Washington Wizards saw their first-round series lead cut in half Friday after losing to the Chicago Bulls by a 100-97 score at Verizon Center. Potentially an ever bigger loss -- dare I say a Monumental loss? -- could be the loss of Nene, who was ejected after a skirmish with Bulls guard Jimmy Butler, then suspended for Game 4. The two were tangled following a Nene layup in the fourth quarter. The two went nose-to-nose before Nene wrapped both hands around Butler's head and neck. The two were separated and the Brazilian big man was escorted to the locker room. Meanwhile, Butler remained in the game and hit a go-ahead 3-pointer with 24 seconds left to give Chicago the lead for good. 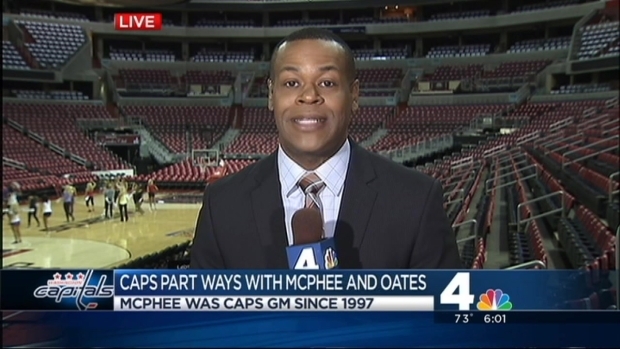 News4's Jason Pugh has an update on the Washington Capitals firings and why Wizards forward Nene was suspended. Nene has been a difference maker so far in this series and his presence has been vital in the Wizards' resurgence. The one-game suspension is a dent in Washington's feel-good story. Bulls center Joakim Noah seemed fairly convinced that his low-post counterpart will be sitting out of Game 4. Follow Adam on Twitter @AdamVingan and e-mail your story ideas to adamvingan (at) gmail.com.